Our quality can rival best olive oils in Spain. And in addition, our olive oil is organic, so it satisfies customers demanding best quality and exceptional taste, and also customers demanding products of organic farming, besides quality. While organic production does not always translate into the best taste, it is common to find the most of the best tastes in food that has been produced organically, that is as nature intended as opposed to created in laboratories and raised with lots of man made chemical compounds. Organic farming stands in stark contrast to conventional farming where a culture of intensive labour predominates with the massive application of chemical herbicides, pesticides and fertilizers of synthetic origin. These substances disperse in rivers and soils for years. Conventional farming provokes the loss of the agrarian landscape, which is disappearing year after year and the drastic decrease of biodiversity, by the progressive diminution of the fauna and flora, unable to resist the irrational exploitation of the environment and the use of chemical products. 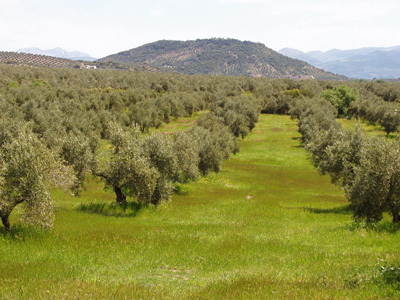 In case of conventional farming of olive trees, chemical pesticides, herbicides and composts are widely used in the cultivation, being possible to detect residues of such products in the olive oil we eat. Impact of some of these chemical residues present in olive oil may increase when heated. On the contrary, organic farming is a cultivation method which makes no use of synthetic chemical substances, GMOs and derivates. The organic farming followed since years in our Estate Cortijo El Tobazo is the technical and environmental evolution of the conventional agriculture, enabling to obtain a production of top quality without contaminating the environment. The whole extension of the estate "el Tobazo" is exclusively cultivated using organic agricultural techniques, paying special attention to the application of spontaneous vegetable covers, which do not alter soil´s composition, structure and biodiversity, and which in turn, prevent erosion and soil degradation. 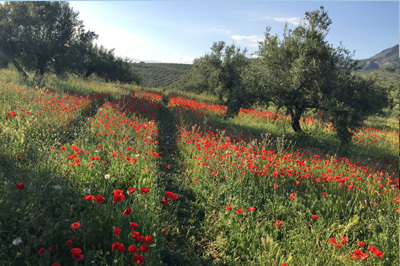 Our organic farming system is focus on keeping a natural forest of olive trees interfering the least possible (only pruning and clearing the vegetation cover). Nature itself makes most part of our tasks, and we respect its rules, cycles and productions. This philosophy should be followed by any producer in favour of Environment friendly agriculture. 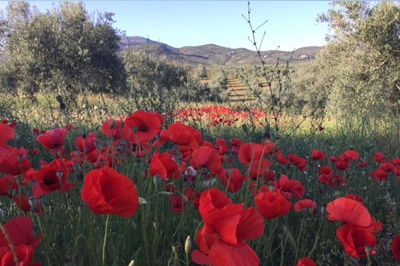 We are growing a bio-diverse olive forest able to sustain 197 different species of fauna and flora, as nature intended. 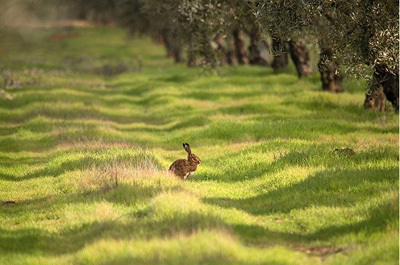 We do not have to use herbicides, or pesticides, beneficial fauna and flora helps us to protect our olive groves. 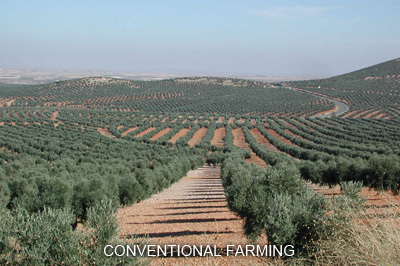 Here you can see several pictures of our organic olive groves and one picture of conventional olive farming. 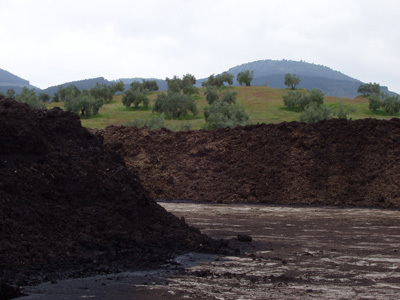 All waste generated during the production process such as pruning remains (branches, leaves), waste water and mill waste are composted, together with dung from organic extensive cattle farming in order to achieve a natural organic fertiliser which is afterwards incorporated to the olive grove. This technique allows us closing the production circle of the organic material and nutrients and recycling all by-products generated during the course of this activity. This way, only olive oil is generated in our facility, no other byproducts or residues, circumstance that very few facilities are able to achieve. CAAE (for EU, regulation on organic farming EEC 834/2007). Since 2001. USDA (US, NOP). First Spanish producer to obtain USDA certificate. Since 2003. JAS (Japanese agricultural Standard). Since 2004. CChinese organic certificate. First Spanish producer to obtain Chinese certificate. Since 2011. Despite being organic, our olive oil is not more expensive than other olive oils of similar quality and presentation. It should be, but it is not. Price of a high quality extra virgin olive oil is fixed depending on the date of harvest, production process, production capacity of olives, package and mainly depending on the placement of the brand and price strategy the producer plans to do. 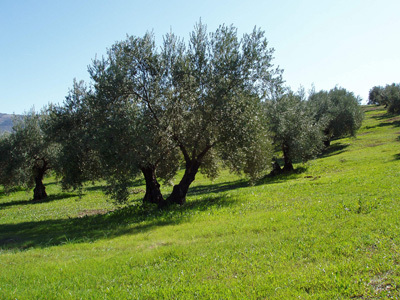 Our aim is to offer a top quality olive oil of unique taste, and that it is organic, at a fair price to convert it in a must choice for consumers. We encourage consumers to have it as a daily olive oil, paying only a bit more than other extra virgin olive oil of lower quality. Having own trees and mill, we control all costs, we do not need to buy any product from third parties. And our philosophy is not to be in the top of prices, only in the top of quality. If we are involved with quality, with environment and with health, it is because we want our olive oil to be enjoyable by as many people as possible. Our prices are very reasonable to be in accordance with our philosophy.